This card gave me a headache. Literally! I was determined to make something lovely and no matter how hard I thought or tried different things, it just wasn't working. It seemed too flat... lifeless. Then I decided to look beyond my usual scrapbooking embellishments and pulled sewing and knitting notions from my Mother's stash. I found the gold cording which really is not cording at all. It's very soft. I made a couple of tassles and decided they would be better suited to the bookmarks I'm making. So back to the shelf. 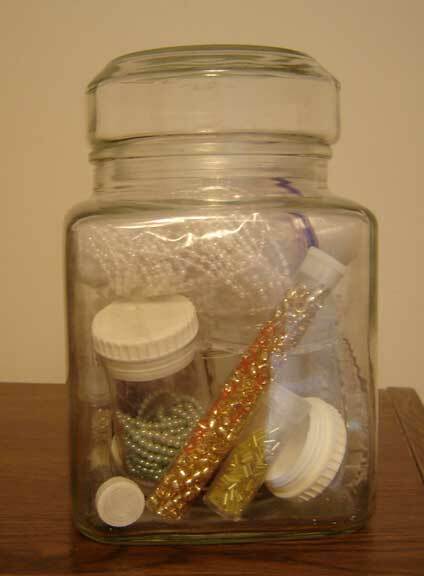 In a jar of beads, I found a little vial of the prettiest gold, shimmery beads. The label said 'knitting beads'. 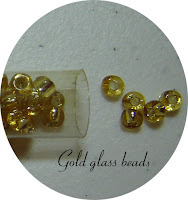 I was so happy to be able to find a use for these shiny little glass gems, and I smiled to myself thinking of what Mom might say if she knew I was using them. Back to the card. The overall size is 5x7 inches. The base is a gold-yellow marble cardstock. I used 6 different papers, some lightweight, some cardstock weight. While browsing through the specialty papers at Hobby Lobby, Michaels and Jo-Ann's, I came across the music paper and the cream with gold swirls. I can't remember where I bought them as I was quite excited about the sales going on at all three stores last week. 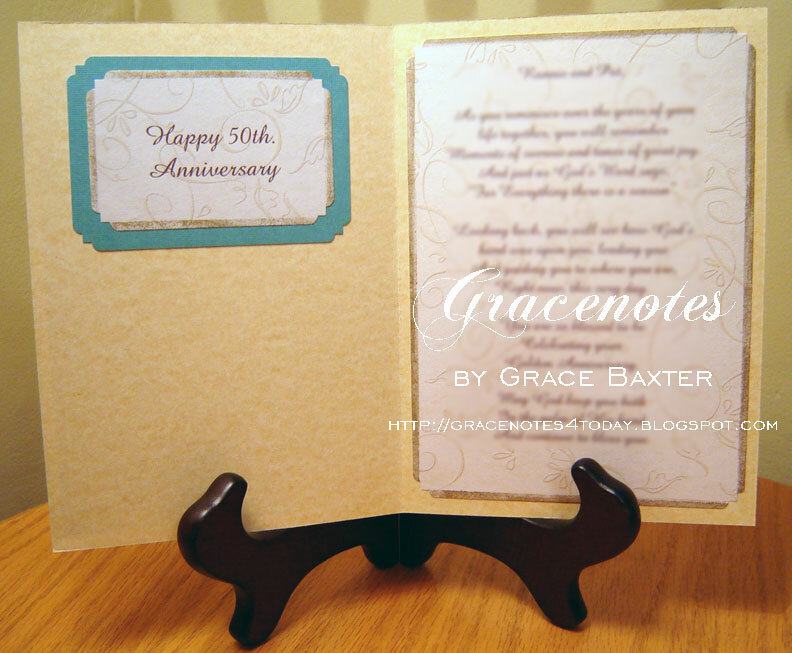 I just knew I would be working with gold for this golden anniversary card. The Sweethearts cartridge has so many adorable designs, it took awhile to decide on what to use. 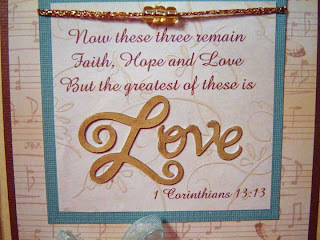 I wanted to use the famous love verse from I Corinthians, chapter 13 (commonly called the love chapter). So first, I prepared the scripture verse on my computer, testing different fonts until I found the one that works best with the "Love" word on the cartridge. I love it's script look. I also wanted the number 50 to appear somewhere. The hardest part was trying to stick to one theme as there are so many ways I could've gone with this. 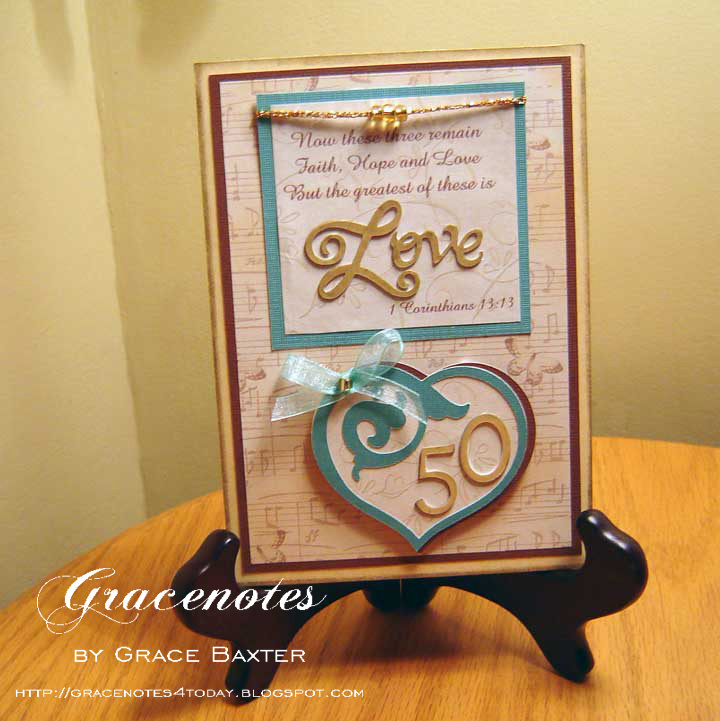 The verse cream square is 3"x3", then matted on sea green to give a 1/4" border. The string of beads looked good in a few places, but I like the symbolism of there being 3 beads; for faith, hope and love. That's when I knew they needed to be at the top near those words. The scroll heart is cut at size 2-1/2, shadowed with brown and popped. There are 4 layers to the heart, not counting the numbers. The numerals 5 and 0 are layered on top of 4 copies from white stock, edges inked with gold to match. 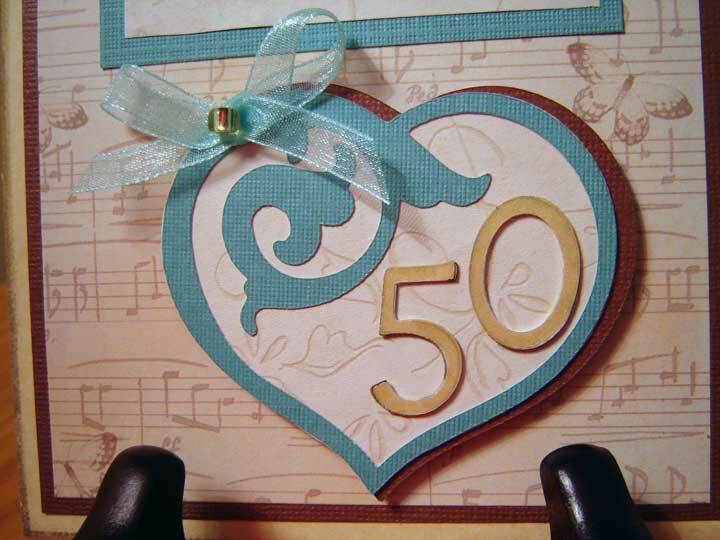 The top faces of "Love" and "50" are cut from a luminescent, shimmery gold paper that feels like vellum. The pictures don't really show it's sparkle. 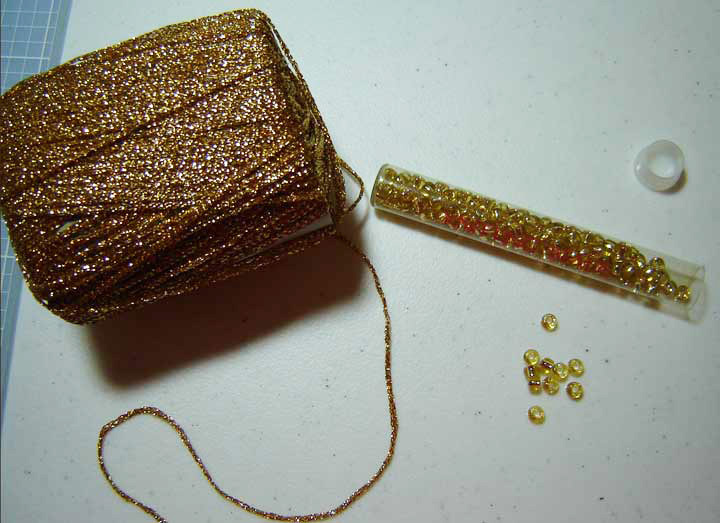 In making the small bow, I worked another gold bead into the tying of it so that the bead sits right in the centre of the knot. I like the way it's perched on the edge of the heart. Inside, the verse was created on my computer, as was the sentiment on the left inside panel. Using gold metallic paint, I inked the outer edge of the front, and the cream swirl frames inside. What beautiful cards you are making! Very creative and original. You've done a great job on your blog...I love seeing what other people are doing. What a lovely lovely 50th Wedding Anniverary card. I love all the details that you have placed there with great care. Thank you for stopping by my blog to become a follower...and I now follow your wonderful blog. I just discovered your blog today and I love your work. 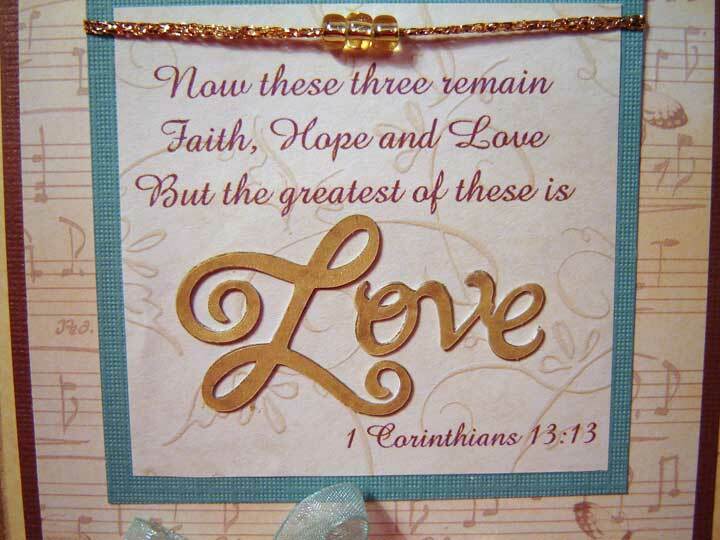 I would like to use the "Love" from the Sweathearts Cart on some of my cards and I would like to know just what font you found that matches it so well. I am new to hands on card making and like to keep using my computer for the sentiments. 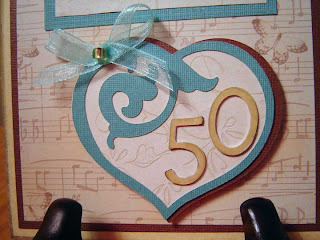 I am also an avid Cuttlebug user...embossing seems to add a little "something" to any card.